K.C. Brains Mango® is a stable hybrid of K.C. special selection between a K.C. 33® and an Afghani. With the genes of such famous parents, Mango® seeds can be grown indoors as well as outdoors. This marijuana strain is a perfect pot plant but she also performs well in soil. Afghani ancestors gave her an ability to resist mould and mushroom. 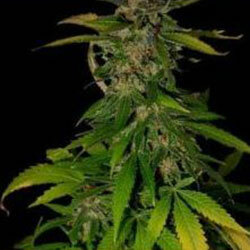 Mango® seeds grow in typically indica way; they are quite short and bushy, with wide dark green shade. The average size of a plant is about 130 cm, however, growing outside, she can stretch up to 3 m. high. This marijuana variety is definitely the one with great potentials. After quite a short flowering period (7-10 weeks), so typical for indica dominated crosses, Mango® goes into explosive budding. The better conditions you can create for her, the better yield she will produce in return. This cannabis plant has massive big buds, a great producer and an early harvest. These plants have very pleasant slightly hash aroma which will carry out through flowering and maturing period. Like any other indica medical marijuana strain, Mango® has a higher yield than any other sativa variety and makes it average as high as 800 gr. per outside plant, and not less than 150 per indoor one. Medicine produced from this cannabis has higher CBD and lower THC counts, therefore she produces a heavier, sleepy type of effect, ideal for total body and mind relax and pain relief. The smell is superb fun and skunky.